Founded in 1987 by the great visionary late Mr. K.A. Veeravu who had the vision and instinct to understand the importance the clay industry would have on the society. Starting out in 1942 with his first factory in Thrissur , he late established various factories in Kerala, Karnataka and Andhra Pradesh. Following his tradition KAP INDIA TILES remains committed to quality and customer satisfaction. In addition to the Indian Market we also export to the Middle East , Australia and South Africa . We are committed to update our products for the client requirements. 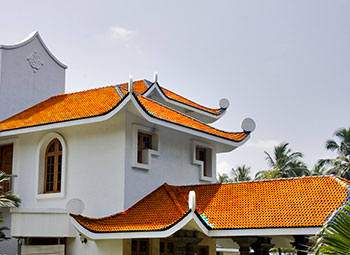 Thus we developed extruded roof tiles instead of pressed ones which conquered the market in late 80’s and 90’s . We have also made a replacement for paired roof tiles in low cost roofs of ‘’costford “ method with 14x9x2.5 Hollow roof bricks which reduced the builders effort to the minimum. We are also the first factory to establish an in-plant laboratory under the guidance of RRL ( Regional Research Laboratory under CSIR now renamed as NIIST - National Institute of Inter disciplinary Science & Technology . We have all physical analysis facilities in our laboratory.